Setting your table for the holidays is so important. It might seem like a small detail, but the table (like the kitchen) can be the heart of the home. Especially during the holidays, meals and gatherings play a huge role in building community and hospitality, and we believe they can be an expression of your personal style, too! We are busy dreaming up our holiday tablescapes around here, and wanted to share our favorite pieces to inspire you. The Leila dishes from Pottery Barn caught our eye this season, because of their blend of sophistication and rustic elegance. They have a hand-applied glaze, and they look stunning paired with copper accents and natural wood pieces. Don’t forget the basic pieces you’ll need for a table setting, including matching flatware, and plenty of linens. You can forego a tablecloth if you want a more rustic look, but a pretty burgundy or mustard looks beautiful for Thanksgiving or harvest dinners. We also love the Scarlett dishes, which have a subtle and elegant grey/blue pattern. I’d pair these with shimmering silver accents and flatware for a dressier event. Marble is not only beautiful, but the new pieces from Williams Sonoma also are functional. You can find their whole collection of serving trays and cutting boards HERE, and they look gorgeous against colors like navy and gold for an unexpected pairing. If your wallet can’t quite handle the Williams Sonoma price tags, Target came out with a similar collection, and most of their pieces are under $50. Their pieces are a great way to begin introducing marble into your decor at an affordable price. This beautiful tray is just $19.99, and would look perfect for your next cheese and wine appetizer. Stay right here on our blog for the latest style news and tips, and how to incorporate them into your everyday life and home! Ar you having a large party or event this holiday season? Allure with Decor offers personalized styling and event decor, in addition to interior design. Let us know via our CONTACT page if you would like to book your event today. Hurry, as holiday schedules fill quickly! If you have a room with a vaulted ceiling, it can feel insurmountable to decorate it correctly. You know I'm always at the ready to work with clients to find the right pieces for their home, but I also wanted to share my best tips for working with vaulted ceilings today. If you're someone on a budget, or who struggles to shop for and acquire the "right" pieces, this one is for you! -Think about the light: Many homes with vaulted ceilings are also blessed with tall, open windows. This is a big blessing when it comes to decor, because flooding areas with natural light is always a positive! If you decide to add additional lighting (which we recommend), look for large, substantial chandeliers or fixtures that won't be dwarfed. You want something that will make a true impact when dealing with such large areas. -Add warmth and lots of cozy elements: Long, beautiful drapes in a neutral tone can be just the thing to bring the eye towards the middle of the room and not always to the ceiling. We love the idea of white or cream colored curtains, made of thicker linen or even velvet, if you're feeling adventurous. Drapes tend to look nicest in dining areas or common areas of the home, and can even add actual warmth during the winter (which helps with heating those rooms with high ceilings!). -Use the right paint color: White and pretty cream shades are ideal for high ceilings...they work well with natural light, and they act as a neutral palette to decorate in the style you prefer. Black and white with a modern farmhouse appeal is a very popular trend right now, yet is timeless enough to last for years. -Choose your anchor pieces wisely: While you may love a shorter lamp, or a a tiny coffee table, these items can easily be drowned by the height of your room. Mix your smaller, less impactful pieces with heftier items like a sturdy wooden lamp, tall plant, or large armoire. Tall pieces should be the ones your eyes go to first (along with your lighting), to make your guests feel the space is "evenly laid out". Don't forget to place artwork at appropriate levels where guests can see them, even if it seems tempting to place them really high on the wall. -Add stunning wooden beams to your vaulted ceiling. Beams are one of the best ways to make a strong visual impact in an enormous space. Whether you choose painted or natural wood, be sure to have them professionally installed and tested for weight bearing and stability before planning around them! They add a true bit of country and rustic charm, and look incredibly beautiful in open concept homes. -Pottery Barn: Always a classic, this store has both brick-and-mortar locations, as well as online inventory, which means you can find nearly everything you may need. Rather than purchasing their "entire room looks", I like to choose some larger, more dramatic pieces to accent design plans. They also have amazing light fixtures, throw blankets that hold up in the washing machine, and occasionally, really unique wooden furniture that you can't find anywhere else. Lastly, their duvet covers hold up incredibly well, for years and years, without shrinkage. -West Elm: If you want a lighting fixture or chandelier that will be a total showstopper and the center of your home, West Elm is the place for you. They have stunning lighting fixtures, although the price tags make them a true investment. Their sofa and sectional couches are also beautiful, not too trendy, and made to last for generations. -Target: Yes, it's true! Not every item at Target is well-made, but for smaller items like the occasional throw pillow, faux plant, and anything from the Magnolia collection, it's a great option and very budget-friendly. Avoid furniture and large pieces, as they are often made of particle board and the paint chips off very quickly. -Home Goods: If you have the time to dig through a bargain marketplace like Home Goods, you can find some treasures. When you're searching, look for quality fabrics and nice frames, artwork for children's rooms or places where you may want to change it up in a year or so, and smaller items like candles and vases. We have also found gorgeous faux trees and larger plants, such as faux Fig leaf trees in baskets for under $100. It takes some digging through the unorganized aisles to find the right items, but it's possible! -Thrift vintage stores and yard sales: When you're on the hunt for something very specific, or something vintage or retro, thrift shops can be a goldmine. We suggest taking a full day to hit up larger thrift stores, and go with a specific list of what you're needing. Don't forget to measure your space beforehand, especially if you're trying to find large furniture items that need to be in an assigned room or area of the home. Bring along a tape measure and notebook, and never be afraid to haggle down prices if you're yard-saleing. Estate Sales can also be a great place for solid wood furniture and large armoires. If you keep an open mind, you can find gems for your space just about anywhere. You can even do it in a tight budget, if you're willing to put the time and effort in. -Peel and stick decals: These are awesome for infusing some design and inspiration into spaces like small bathrooms, kids rooms, or large blank walls, especially if you can’t paint. You can even do peel and stick backsplashes. Be sure to test out the adhesive and removal process, so that you don’t damage any paint when you move out of your rental. We also love things like little polka dots, name monograms, and simple, neutral patterns to give your blank walls a little panache! -Utilize stand-alone shelves and furniture: If you are hesitant to nail things into the wall, try stand-alone shelves (ladder style ones), and over the toilet cupboards to increase your storage space, and give you the look of bookshelves and mantle shelves without the commitment and damage to the wall. We like the look of this one for small bathrooms. Aim for higher, taller pieces for more design impact in small apartments and townhomes, because they will draw the eye upward. -Mirrors and wall hangings: If you do decide to hang items on the walls, try using the 3M removable tape and hangers that come off without damage. Mirrors and large paintings can make a big impression, especially in small rooms that don’t have a lot of natural light or windows in them. Look for round or square mirrors in neutral colors, like distressed wood, white, and dark wood tones that will go with your decor even if you change color palettes. -Add cozy elements: If you want to make your rental feel cozy on a budget, look for textured throw blankets, pretty pillows, and curtains. Look for curtains that are the proper length (ones that are too short or bunched up on the ground will draw the eye to that first and will look cheapy), and use neutral tones to make a small space look larger. We love places like HomeGoods and TJ Maxx for inexpensive items that look more high-end. -Incorporate plants and fresh flowers: Purchasing fresh flowers is a great way to add a little life to your apartment or rental home, and also can add a pop of color. 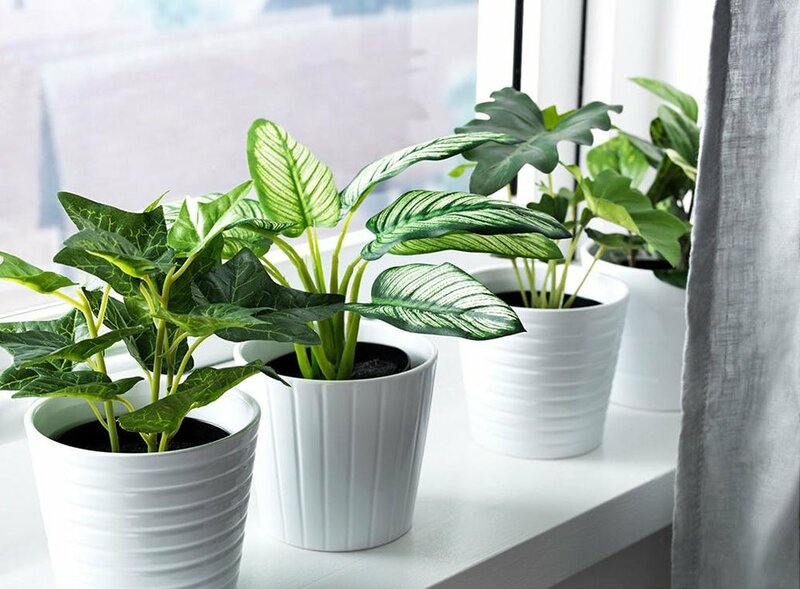 Faux plants in little pots are another way to get some greenery into your rental without the upkeep of real ones and the watering duties that come with them! If you have a patio or backyard area, large potted plants and trees (faux) can add a little more personality as well. No matter where you call home, these tips can help your rental feel like the place you can’t wait to come home to! Best of Target Decor under $50! Springtime and summer is filled with extra expenses: camping, extra snacks, and sports camps, just to name a few. So when it comes to sprucing up little decor pieces around my house, I love to keep it budget-friendly in this season. As a mom, I think we all know how often we do a "Target run", so I wanted to highlight some of their very adorable and affordable pieces. They have a brand new line called Opal House, and of course, some awesome Magnolia inspired items. Ready? Let's go! Opal House is very trendy, and has a boho/Anthropologie vibe. Some pieces are a bit trendy and cheap looking for my personal style and taste, but there are some true gems in the collection as well. These cute mugs would make darling teacher gifts, and they look just like Anthro for only $6 per mug. We also love their serving dishes, which are all under $20, and have a boho summer feel that's perfect for hosting friends on your back porch. Hearth and Hand by Magnolia is a little more my speed, and I always have to zip by the aisles quickly, so everything doesn't land in my cart! Here are a few favorites: This steel punched tray is just $35 and it can go basically anywhere in your home! We think it'd look awesome on your dining table, or serving drinks on the patio. It'll also wipe clean and be useful year round because of the natural color. 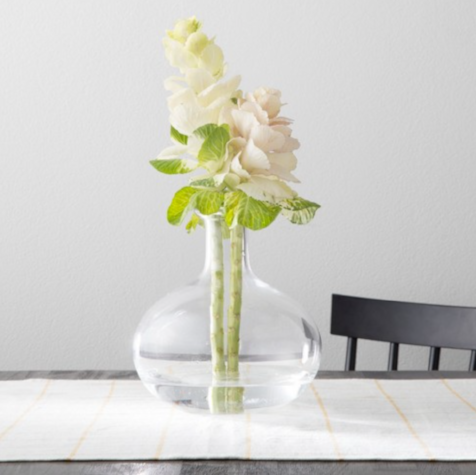 For your table or mantle, you'll also love this darling vase. The edged lip is classic and timeless. When it comes to a versatile item, if you have $35, check out this adorable Threshold pillow with timeless ticking stripes. It's not made of outdoor fabric, but you could put it on a settee that's under cover in case of rain. We also think it looks great piled up with floor cushions around a fireplace, or on a bed that's a neutral palette. This white eyelet pillow has great texture, and of course, you know I love all things cream and white! I hope these ideas have given you inspiration on how to add some spring and summertime flair to your space without going over your budget or spending very much money! Stay tuned to our blog for the best money-saving and inspiration tips! One of the hallmarks of the farmhouse aesthetic is a rustic, vintage look. If you’re at all familiar with my blog, then you know that I absolutely love this aesthetic, and have for quite some time. I love the challenge of turning a modern home into a vintage farmhouse paradise, and in the years that I’ve spent transforming 21st century styles into rustic wonderlands I’ve realized that one of the easiest ways to give your home a quick dose of farmhouse is in distressed furniture. It’s the perfect addition to your budding rustic decor, and they’re either easy to find, or to make (figure out how to do that here). Here’s five that you need in your home! You can find one in every home. They’re the backbone to clothing management, and they’re often one of the biggest pieces of furniture in a room. What’s great about their popularity is that you can find them being sold (or given away) just about anywhere. This is great for those who are looking for a distressed set because you’ll often come across them that way, requiring little effort on your part to make it just the way you want. You’ll find them in thrift stores and craigslist, or if you’d like a professional take on the distressed look, on websites like Hayneedle and Wayfair. The cheapest option will always be finding a set that’s seen some better days, and applying a bit of elbow grease to finish them up to your specifications. Switching out your kitchen lights for a vintage chandelier can add a wonderful touch of farmhouse to your home while staying well within even the lowest budget. Thrift and antique stores are some of the best places to look for these, and they usually don’t require much of a hunt to find a great one. They’ll often be distressed metal, which is the perfect style for a farmhouse look. If you’re looking for a specific style, Etsy has a great selection, ranging from sculpted metal to rustic wood chandeliers, with some even utilizing unique styles like mason jars, or funnels! They’re great light fixtures to add some rustic character to your home. Families are bonded around the dinner table. It’s one of the most important pieces of furniture in your home, and if you’re just starting to create your farmhouse, it’s a great place to start from. 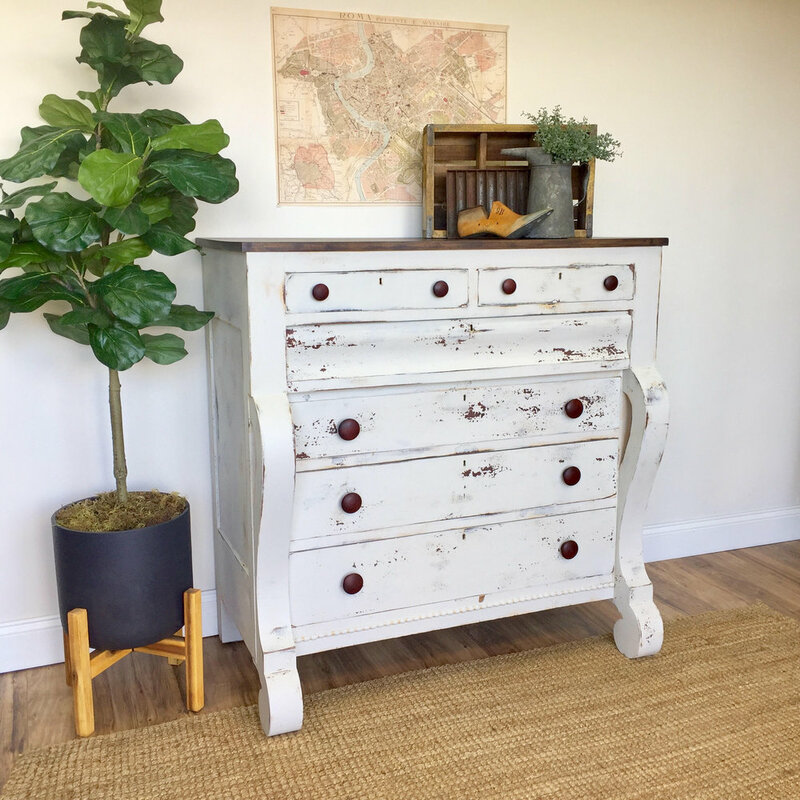 Finding one in a thrift store won’t be as easy, but sites like craigslist often have ones that are already distressed, or are ready for your handiwork. This is a wonderful place to show off your creativity: you can get a matching set of table and chairs, or you can add a pop of color with painted chairs with that same distressed style. It all comes down to how you’d like it, and in the end, that’s always the best way. 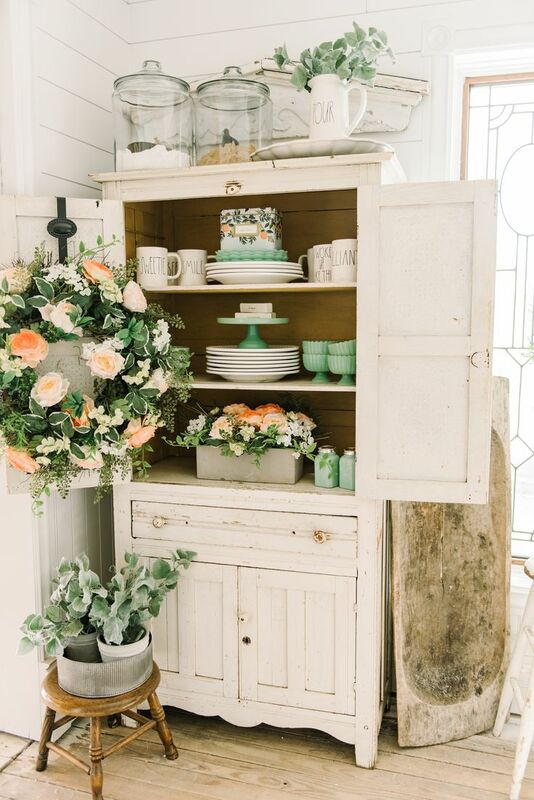 What better way is there to display all of your vintage dishes and glasses? The hutch is one of the most popular pieces in homes of all styles, which means you’ll be able to find one that you fall in love with fairly simply. All of the above mentioned places - thrift stores, craigslist, etsy, etc. - will have numerous pieces with lots of character already in them. There are so many styles that really embody the farmhouse aesthetic, with wonderful carved wood and glass panes, which gives you full creative expression to choose one that fits the rest of your unique farmhouse decor. Alright, so this isn’t a furniture piece, but it’s key if you’re a DIY-minded creative who wants to make your own distressed and colorful style. This means you can transform any piece you find into a classic farmhouse staple, all from your own hands. If you’re new to milk paint, this is a great blog explaining what it is, how to get it, and some beautiful examples of what you can do with it. Milk paint really gives you the creative freedom to make your home your own. Those are just a few of the many farmhouse pieces you can add to your home to make it warmer, and bring the whole family together. I hope it helps you make your farmhouse home truly yours! When the blue skies come out...I head inside. Why? Well, I start spring cleaning! Now, for a busy working mom like myself, it's hard to find time to de-clutter, and it seems we have an influx of things always coming IN, rather than going out. But, I love the feeling of breathing a little easier and clearing out things we aren't using. Every spring, the urge to pare down our belongings and clutter comes on strong and I love the way it motivates me! Here are some of my best tips for clearing out the things you don't need, and giving yourself more room to be creative, feel more focused, and bring more peace to your home. After all, less stuff means less time spent stressing over, and cleaning, all the things. Make three piles: I like to use laundry baskets for this, but you can also use something like large paper bags or wicker baskets. Label them TOSS, DONATE, and SELL. I tackle one room at a time, such as the kitchen, or a bedroom, and divide any clutter items into these three piles. Selling items on craigslist or Facebook takes quite a lot of time, so remember to be realistic, and don't save something to sell it, if you know you never will. Donation items should be in working order, and anything broken or yucky should go right into the trash pile. Transport donations or sale items immediately: I've learned that the secret to really getting those piles out of my house, is to do it right away. Otherwise, they sit and I either change my mind, or end up moving the piles around the house. I use the same philosophy for yard sales: when things don't sell, we load them up right away to a donation spot, so we don't have to bring them back into the house. If you're looking for places to donate that aren't the typical Goodwill or salvation army, consider donating to a women's shelter or somewhere similar. Schedule time to de-clutter: Actually writing a day or time down on a calendar helps really ensure the job gets done. Find childcare if you need to, and block out a few hours to get uninterrupted progress made. Ideally, you could sort or toss things once a month, to make it more manageable, but every three months is also a good plan. I read in an article once that when you schedule an hour of cleaning, also schedule an hour of self care, because that is how you keep your house and your mind clear! I thought that was very wise advice! Do small tasks daily to stay ahead: Set aside 10 minute a day to deal with the day-to-day clutter. Sort through your kids' backpacks or school bags, toss junk mail, clean out your purse or work bag, and weed out things from the fridge. Just these simple things will keep your days running smoothly, and you'll feel more productive and less bogged down. Diffuse essential oils: Even if you don't believe in the medicinal properties of essential oils, they smell delightful and can really lift your mood. We recommend lemon or lavender oils for a very relaxing feel. They are also less toxic than some candles, which may be great for those with asthma or who are sensitive to strong candle scents. Mix up textures: We like the idea of mixing up textures in your living spaces, especially with pillows and throws. It's no secret that we love a good throw blanket, because they add instant coziness to a space. Plus, little ones love making forts or beds with them, and they're great for curling up with a good book or a movie! If you need a new throw, try this affordable, machine washable twin blanket from Target. It's bigger than a traditional blanket and extra warm. It comes in plenty of pretty neutral colors. Get some fresh magazines and books to read: In the digital age, it can be hard to step away from your phone and laptop, but a good book can be just the ticket. Check out Oprah's book club for some great reads that will keep you inspired and expand your mind. A magazine like Real Simple or Southern Living is a relaxing read for a long bath, and you don't have to be too worried if the pages slip into the bathwater! Try a bath bomb: The bath bombs from LUSH are our absolute favorites. They are cruelty free and made with organic ingredients that are good for your skin. They are definitely a pricey luxury, but you will love the way they instantly relax your muscles and make you feel capable of handling anything that comes your way! Change out your photos: Studies show looking at photos can improve our mood and make us feel more energized! Swap out old photos in the frames and shelves in your home for newer memories, and make your home a place where your family can always look around and feel loved! Order fresh canvases or framed prints for photos that have been languishing in drawers or on your computer or smartphone...they will definitely make your home feel more personal and relaxing! Like clockwork, December’s rolled around again, and with it came the bitter cold. I don’t know about you, but I love the snow, and the whole season! One of my favorite things is a landscape covered in a perfect blanket of snow. But I can only handle the cold for so long, until I have to retreat back indoors to warm up by the fire. During the winter months, our homes become our heated safe havens, but heating them can be incredibly expensive. Instead of turning up the thermostat, I like to use some of these inexpensive but warming decor styles to help me deal with the cold. Farmhouse decor has this style integrated very well. Every time I walk into a house boasting the style, I feel so warmed, surrounded by the woodsy interiors and the rustic color schemes. The style has been making a comeback for a while, but its roots are in the rustic cabins and lodges out in the woods, and those that built them knew just what they needed to shield themselves from the cold. Today, we’re not in a fight against the cold as much as a century or so ago, but we can take some cues from their decor and translate that into modern style. The most obvious one is wood itself! It has an insulating effect, keeping in the heat, and the woodsy look has an ambient effect that just warms you up from the inside out. One of my go-to’s when the snow starts to fall is an age old solution: a warm blanket. Turns out, just the sight of an afghan or a knit has a warming effect in the home, cozying up the whole room. Spread around a bunch of cozy blankets to warm up your decor instantly, and having a knit close by means you never have to be chilly again. Pair it with a nice reading lamp and a comfy chair in your favorite corner, and you have the coziest place to snuggle up with a good book. Work on the whole room by layering fuzzy or warming rugs, if you have a hardwood floor, and use pillows to lighten up the room and give it a very inviting, snuggly feel. Leather is another one of those farmhouse staples. Back in the day, it was entirely practical to furnish your home with natural leathers, as farms were often self-sufficient and used every part of an animal. Today, there’s many options for those who have qualms with leather, and you can still get that heart-warming look no matter what you go with. A leather furnishing inherently has a sense of character to it, and that brightens up any spot it’s put in. Pair the rich color of the leather with a cooler gray or neutral palette, and you get a great mix that’ll warm you to the core. It’s easy to use some pops of green to really pull it all together, if you like having plants around the house. If you like a more southern rustic theme, use some cactus or desert flora to really sell the mood. Lastly, take a look at how your home is lit. If you have access to a lot of natural light, either through your windows or through a skylight, utilize it! Light, of course, is naturally warming, so keep those curtains open during the day to heat up your house for free. Also, take a close look at your windows to make sure no air is escaping through them. You want to be able to retain as much heat as possible, and it’s no good if all of it is being sucked out from cracks in your window frame or a door draft. You wouldn’t expect it, but you can really feel the difference when you make sure your home is leak-proof. If you don’t have a lot of natural light, use some warming, brighter light fixtures, and make use of candles. Not only will your home smell great if you use them, but you’ll feel cozier just gazing at the flicker from across the room. The winter season is one of my favorites. Snuggling up with my family around the fire is one of my favorite pastimes, it makes my heart so warm. Coming in from the snow when your whole home is full of cozying decor makes life so much easier, and adventuring out in a frozen wonderland much more enjoyable. Here’s to snow outside and warmth inside! via Peggy Proschen's cookbook, "Cookies"
Using an electric mixer with paddle attachment, cream the butter, sugar and chosen flavouring until well mixed and just becoming creamy in texture. Don’t overwork, or the cookies will spread during baking. Beat in the egg until well combined. Add the flour and mix on low speed until a dough forms. Gather it into a ball, wrap it in cling film and chill it for at least 1 hour. Place the dough on a floured surface and knead it briefly. Using marzipan spacers, roll it out to an even thickness. Use cookie cutters to cut out the desired shapes and, using a palette knife, lay these on a baking tray lined with greaseproof paper. Chill again for about 30 minutes and preheat the oven to 180C/160Cfan/350F/gas 4. Bake for 6–10 minutes, depending on size, until golden brown at the edges. Leave to cool on a wire rack. Wrapped in foil or cling film, they will keep well in a cool dry place for up to a month. Tip Always bake equally sized cookies together to make sure they cook in the same time. If you mix different sizes, the smaller ones are already cooked when the larger ones are still raw in the middle. Mix the merriwhite with 150ml water and pass through a sieve to get rid of any lumps. Place the icing sugar in the clean bowl of an electric mixer, add about three-quarters of the merriwhite mixture and the lemon juice, and start mixing on low speed. Once the sugar and the merriwhite are well combined, check the consistency. If the sides of the bowl still look dry and crumbly, add some more merriwhite until the icing looks almost smooth but not wet. Keep mixing for about 4-5 minutes, until it has reached stiff-peak consistency. Spoon into a plastic container, cover with a clean damp j-cloth and the lid. Store at room temperature. Simply thin down your basic royal icing with water, a little bit at a time, mixing with a palette knife, until you have the right consistency. Keep your icing covered with cling film or a damp cloth when not using it, to stop it from drying out. I can smell it now: the pumpkin pie cooling on the windowsill, the marshmallow topping melting over the tender yams, and the glorious turkey (or ham) sizzling in the oven, filling up your kitchen with the best of scents. It’s one of my favorite times of year, and I can’t wait until get to put up my decorations every year! There’s so many great ideas for sprucing up your home with autumn’s charm, but I’ll start you off with a couple of my favorite picks. The first place you think of when thanksgiving runs across your mind is the dinner table. The whole holiday takes place around it! It’s always a challenge preparing the feast you eat off it, let alone sorting through the difficulties that come in deciding how to decorate it! But once you decide on a general theme, everything falls into place. For example, pumpkins never fail to bring the fruits of fall into your dining room, and to break from the mold you can use white pumpkins to foster a softer atmosphere, and paired with some candles, white flowers, and other accent pieces that fit your theme, you get an all around cleaner look. Or, focus on rounds of wood for your place settings and surround them with greenery for a rustic, earthy style. If you’re not as much into wood slices, you can get the same farmhouse look with rope coil charges, and they’re not hard to make yourself! For the plates themselves, follow your color palette and either fold your napkins into a festive shape, or use them as an accent to the rest of the table. Use bits of greenery, like a sprig of sage on your plate setting as a garnish of sorts. While it’s not much on its own, it’s the small things that really pull a style together. One thing you want to avoid is a busy table, though. The only thing you want overwhelming your guests is the sense of awe they get from staring at your beautiful table full of wonderful food, right before they dig in. Holidays are my favorite times of the year, and they’re one of those few moments in life where you can really make something your own. You can spend forever thinking about all the different trends and styles going around these days, but it’s important to remember to do what you like to do, since it’s your own home, after all. So take some of these ideas, put in some of your own, and make this thanksgiving one for the photo album! Okay, so maybe you don’t have to get rid of everything, but another honest look at all the things you own, and whether they're really necessary or beneficial in your life would be a good place to start. As we’ve all heard time and time again, there’s a big difference between want and need. Often, it’s the things that we actually use day after day that are necessities, and most of the stuff we have we hold onto because we spent money on it once, and just can’t part with it. Maybe we bought something we don’t need, and that’s fine. Everyone does that, trust me. Or maybe you purchased something you needed for a while, but now it just sits around and collects dust. If you’re like me, you don’t like to see things go to waste. So rejoice with me that there’s so many options for giving things away to people who actually need them, or in repurposing stuff that can’t really do any good by itself. If you want to avoid the hassle of a yard sale, or if you’re living rural, then look around a bit on the internet or ask some friends where you can donate your clothes, your furniture, or anything else that you don’t use anymore that you think someone else could use. There’s an awesome trend going on that involves wicker baskets. Lots of wicker baskets. What’s awesome about it is wicker baskets look great, and come in tons of shapes and sizes to suit your style and storage needs. Of course, if you’re not much of a basket person, there’s other options. For example, you could get (or make!) a couple of fabric covered boxes to use. There’s as many styles as there is of fabric, and they usually go for a good price. You can always mix and match, depending on your decor. If you get your hands on some cubby shelves, the decorative boxes can be just the pop of color you need in your home. Wicker could be just the accent to your room to give it a more rustic, or a more personable feel. You never realize the power a box or a basket could have over you until you change the mood of an entire room with it. HERE’s a great guide to wicker baskets; and HERE’s a great guide to your own DIY decorative boxes. It’s not just the cabinets, or the closets, or the dressers that should have all the fun of storing things. The whole idea of multi-purpose furniture is taking something that’s known for one use - say, a couch - and redefining it into something that can accomplish many things at once, while still retaining its original purpose. Minimalism is trendy lately, and I think it’s one of the best trends to come around. Or, really, come back around. It’s an age old practice, and one that brings a lot of calm and restfulness into your home, due to all the open spaces and organization. There’s so many different styles and types of multi-purpose furniture to choose from, and a lot of them are very well made and look fantastic. They’re valuable, so the price tag may go up, but remember that what you’re getting is essentially two or three pieces of furniture in one. It may just come out to be quite the deal. And you’ll feel better about conserving the space, too. Hopefully this small list has helped you in some way. I know for me, de-cluttering has helped me unwind much easier, and it’s been so nice to be able to come home and start to relax the moment I walk in the door. Even on days spent indoors I feel more peaceful seeing everything organized and spacious. It makes me happy, and what’s better than that? The dreamy feel of European style has me conquering the winter doldrums these days! I dream of returning there someday to gather even more inspiration. The cool thing about the style across many European countries is the way it incorporates so many elements; decor, art, gardens, and architecture. I once talked my husband and kids into flying across the country just so I could indulge my senses at the Peggy Porschen Parlour in London! I don’t know if you’ve heard of this delightful little shop, but it’s a boutique bakery (yes, that’s a thing!) rich in lavish tones and feminine pinks. I was actually caught running my hands over the vintage wooden floors (whoops! ), and smelling the caramel tea! It truly was a feast for the senses. These places also inspire my wedding planning! When I plan feminine weddings with rustic touches, I find myself incorporating touches of my travel into the ideas. Another great place to find european style inspiration is Pinterest, of course! You can find tons of home decor ideas by searching “european style homes” and looking through the unique tile details, paint colors, and lighting fixtures that are the hallmark of the chic style. You don’t have to go all-out with a european style, but you’ll likely find that most modern trends carry just a little bit of european flair already within them. I love the european farmhouse style! Want to schedule a personal consultation for your wedding or home? I’d love to share my travel inspiration with you and help you design the day/event or room of your dreams! We love our summer whites around here, and the breezy, bohemian feel of the warmer months. But, Autumn is calling, and it’s time to get our homes ready! We are swapping out lightweight linens, crisp whites and citrus scents for the rich textures of fall, spicy candles, and rustic tones like oatmeal, pewter and burnt orange. Here’s our ideas to get your home ready for the crisper, cooler weather... just add a pumpkin latte and a good book! These richly toned pumpkin pillows will add a quick burst of fall colors to a neutral room without a ton of expense. The intricate panel on each pillow is velvet, and you know I am all about the mix of textures! You can find them right here at Pottery Barn. We also like this pumpkin pillow and it’s watercolor look (it would look great on a grey or taupe couch, or a big cozy chair. Nothing says “fall” like a big, woven basket. While Pottery Barn shows it filled with pinecones, we think this basket would be adorable filled with cozy throws! We love this cable-knit throw from Target (and it’s under $50) in the marigold color. Try pairing it up with a faux fur throw for a welcoming look. Don’t forget your table decor...after all, that’s where you’ll be serving up fabulous treats for Thanksgiving and all your holiday parties this fall. We really love the terra cotta pumpkins from Ballard Designs...they’re unexpected and elegant in their own way, and they look stunning with mercury pumpkin accents for a nice contrast. Add in taupe linens and rustic pieces for the perfect centerpiece that will leave your guests raving! Planning a large party? We would love to help you stage, decorate, and throw the most amazing event. Contact us here for our event rates and more details, and let us take care of the rest! Today, I’m so delighted to share with you a brand new venture, offering Southern Oregon and the surrounding areas exclusive access to incredible furnishings! "Minery Rentals was born out of a strong design to see more luxury, modern and unique world traveled treasures to the Rogue Valley and surrounding areas. We love well-traveled pieces that come with a story, but our priority is rooted in quality as well. We’ve had a huge response from the local community, and are so thrilled to be involved in the wedding industry on an even deeper level, as well as events, home staging and styled photo shoots.”, explains owner Betsy Tomasello, who launched the curated and unique brand in 2015. The rental inventory is available to anyone, and the target audience includes weddings, special occasions, corporate marketing events and conferences, and staging real estate properties. “We have a wide range of clients, and welcome inquiries for any type of rental need”, continues Betsy, "and we are happy to ship our items to pretty much any area. Just drop us an email with your event details for a custom delivery quote." "We strive to make everything as simple and easy as possible. Clients can schedule a private warehouse viewing or stop by during one of our open houses to pick out their items. And, we are constantly updating our website to allow clients the ability to browse all of our inventory online as well! Reservations made in house or via email at mineryrentals@gmail.com just need a 50% deposit and a signed rental contract to reserve the items”, she adds. The rental service fills a void that was needed in Southern Oregon for beautiful, unique and high-quality pieces. Minery Rentals has a huge range of decor items including tabletop pieces, natural wood consoles, the highly coveted vineyard chairs, and a mix of high-end Restoration Hardware pieces, including some of their beautiful chandeliers. With crisp Spring weather peeking out from behind the clouds in my area of the country, I’m getting excited for warmer days and spending time outdoors. Although I love creating indoor spaces and relaxing rooms for families and businesses, I also love making outdoor spaces inviting and fun. Here are some great, curated pieces, as well as where to find them. By drawing inspiration from these items, you can make your personal outdoor space inviting, relaxing and practical. I love the look of this Pottery Barn chair, but the price tag can be a bit hefty, especially if you want to seat a number of guests in your backyard or patio. I also like this Target option, which is well under half the price, though it is lighter color and has a slightly more rounded design. Don’t overlook places like vintage resale shops, Goodwill, and online special sale sites like Wayfair and Zulily for other great pieces. Target also has a whole collection of Farmhouse-inspired decor this year, for their outdoor collections, and it’s really beautiful! With pops of color and light teal, it manages to be affordable but not look too cheap. I love this pillow, which falls at less than half of Pottery Barn’s cute pillows. You can mix and match high end and low end pillows for a great look that is more affordable. Target also has a huge collection of wooden trays, and canvas seat cushions to add some flair to your space, so don’t forget to check there. Rugs, lanterns and umbrellas can add color and texture and ultimately, make even a concrete patio more inviting and warm. A few strands of twinkle lights can also add a fun ambiance. I love drawing inspiration from places like Pottery Barn, West Elm, and other high end decor stores. 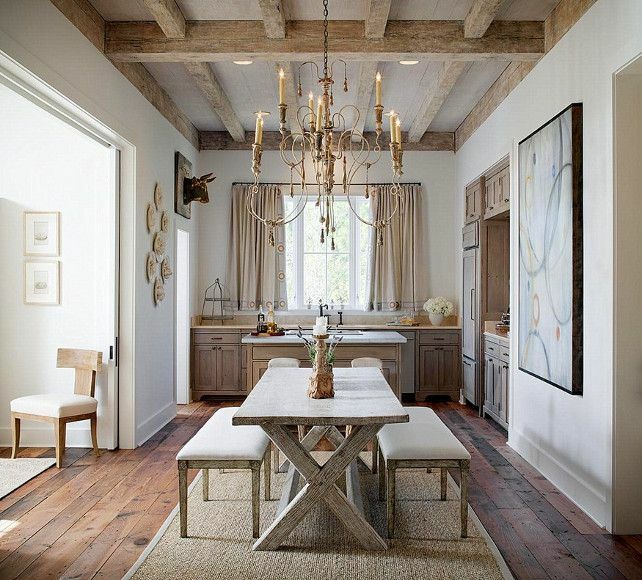 Although this image has a few more modern elements than I normally veer to (I love the more french styles and farmhouse/shabby chic), you can see the way the rug and varied wood textures really pull the look together. This would look great in a small or large space and still feel intimate. 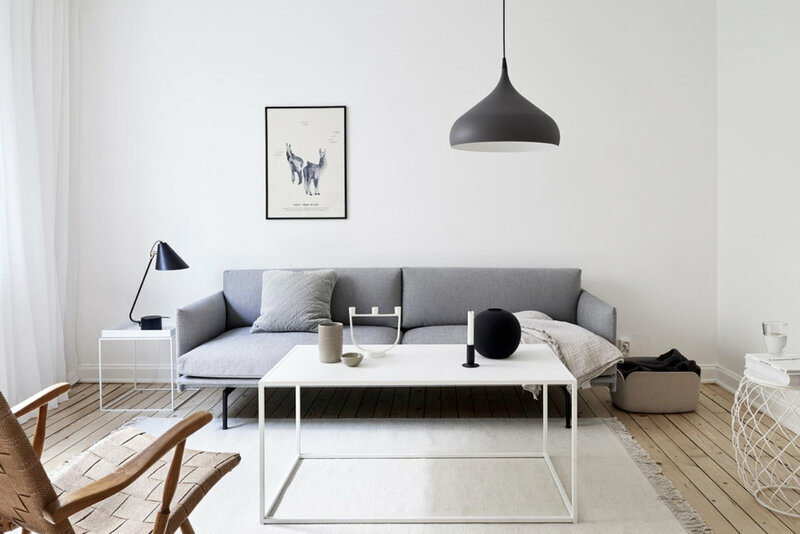 (Image via West Elm, furniture and decor via West Elm), you can shop the look here. Pinterest is also a great way to visualize how an outdoor space might be best set up. And, don’t forget that I’d love to come help you style whatever area of your home needs a polished touch. Give me a call today! During this time of year, it’s easy to get nostalgic, but I always do anyways! I feel so thankful for the many friends and clients who have crossed my path this year. I still find it amazing that I’d be honored to enter into your lives and your homes to help make them special, beautiful, and practical for your family. YOU truly are the greatest gift imaginable. THANK YOU from the bottom of my heart for allowing me that privilege. From my family to yours, we wish you a beautiful Christmas and a very, very happy new year! Have you seen the fun faux windowpanes popping up in decor lately? They’re so cute, and I’ve been dreaming up ways to incorporate them into my styling. I noticed them on HGTV’s Fixer Upper recently, where stylist Joanna Gaines used them to liven up one of her renovations. She always has great taste, and I’ve seen her add them in, mixed with greenery and other accents to work with the distressed wood. With this trend, you can do anything from a subtle photo frame with a windowpane style, to a full, vintage window with the glass removed. You could use a simple photo frame like this floating windowpane one from Target like this one (for under $35!) to bring a subtle touch of the french inspiration to your home, or you could scour salvage yards for real vintage windows and bust out the glass panes. Make sure, if you find old windows at thrift stores or yard sales, to watch for shards of glass and splinters. Sand down rough edges and make sure it’s safe before mounting with heavy duty hardware! You can also incorporate them into wedding or event decor! It takes a bit more planning and effort, but they can be hung as a beautiful backdrop for photos, or for a styled birthday or baby shower. Make sure you hang them from a strong beam or support so your guests don’t end up with one on their heads! Lastly, you can try a faux window as an alternative to a headboard! I saw this recently, but the example did not use a vintage window (I don’t think that would feel very nice to lean up against! ), but they had a custom one made that looked like a windowpane. How would you use this trend?